but , of course, she is much stronger now. Maria played her last rated EGF tournament in 2009. She plays as baduk1 on WBaduk and has 18-2 score. We played each other yesterday (during my simultaneous on 3 boards) and I was suprised to see her current level. It seems that she is not weaker than other Ukrainian 4-6d players. Artem (artem92 on KGS) is of course stronger, but I don't think that other Ukrainian players can beat her easily. 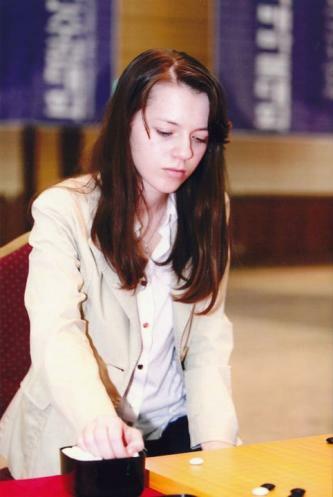 Svetlana Shikshina (redrose on KGS) started to learn Go in Korea as an insei at the age of 17 (as Russian 4-5d). Maria started 2-3 years earlier as 1d. As you know, it's very important to start early! I feel that in few years Maria can improve a lot and she can become a hard opponent even for top European male players! About our game: Black was too much afraid of me, it seems. I saw too many defensive moves. But anyway, it was not an easy game for me. Greenwich Mean Time (GMT) is arguably the same as Coordinated Universal Time (UTC). Alexander, whats the time zone difference for simultaneous games schedule on wbaduk? Compared to GMT? What Moscow time?